My great-grandparents enjoyed cornbread in homemade buttermilk as their evening meal almost every day of their life. They rounded out their breakfast with biscuits, butter, and honey. In spite of the hard labor and lack of modern miracle drugs, my great-grandfather lived to be 99. He scandalized the family when he was 96 because he wanted to marry his housekeeper (Great-Grandma had died 3 years earlier). He either had amazing genes or was eating right. Fermented milk products like yogurt, kefir, and buttermilk are said to be the significant contributing factor of longevity in countries like Bulgaria, Romania, and Turkey. Even today in Bulgaria, many live to be over 100 years of age! It is important to know that more than 60% of fatal diseases in the USA are related to the gastrointestinal tract (GI). A steady diet of naturally fermented dairy products protects the GI from the diseases that have become the by-products of the American diet. Conversely, homogenization of dairy products is linked to an impressive range of diseases: from autism, to irritable bowel syndrome, chronic fatigue, and heart disease. Homogenization is the process in which the cream particles in milk are broken down and separated so that they will not rise to the top or lump together in the milk. The problem lies in the fact that the fat particles are broken down to be so tiny and “sharp” that they can now penetrate through the walls of your intestines and into your bloodstream. This results in the laceration of your arteries, cholesterol build-up, and poor circulation. Milk can be your best friend or your worst enemy. In ancient times in Middle Eastern countries, dairy products were usually derived from goats. Fermented goat milk in the form of yogurt or kefir is the single, most powerful food therapy for the GI tract. This is what fermented milk can do for your stomach: inhibit putrefactive bacteria! Now with modern techniques, the important bacteria can be freeze dried, encapsulated, and delivered directly to the GI in high strength doses. Nothing against yogurt, but in many cases, I prefer to take my “ferment” in capsule form as Tummy Tuneup. Fermented dairy products are the most basic and natural form of probiotics. Probiotics are available encapsulated or powdered. I think of probiotics as being the opposite of antibiotics. Antibiotics kill all the bacteria in your GI tract – the good and the bad. Probiotics replenish your GI tract with good bacteria. This year, when our whole family got a 7-day stomach flu, I sprinkled powdered Tummy Tuneup probiotics on their food at each meal. It is tasteless, but more effective than eating kefir or yogurt (and does not come from milk sources – it is completely hypoallergenic). The effects of the flu were completely negated. 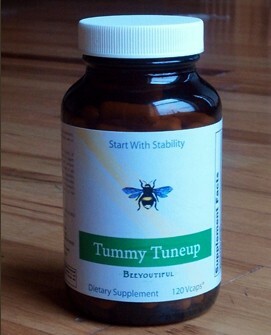 I recently heard form two different mothers who suffered from severe morning sickness; they claimed that taking Tummy Tuneup alleviated their nausea. A few others said that Tummy Tuneup sprinkled in their baby’s milk bottle, or just on the breast before nursing, cleared up colic and tummy aches. Dozens of others have taken Tummy Tuneup probiotics along with Yeast Assassin supplement to restore complete GI health by getting rid of Candida/Yeast infections they had struggled with for years. Come to the free Merryheartmedicine.com forum to find recipes for fermented milk products, and information on all health-related subjects.